CWAers Defeat Right-to-Work in Missouri! 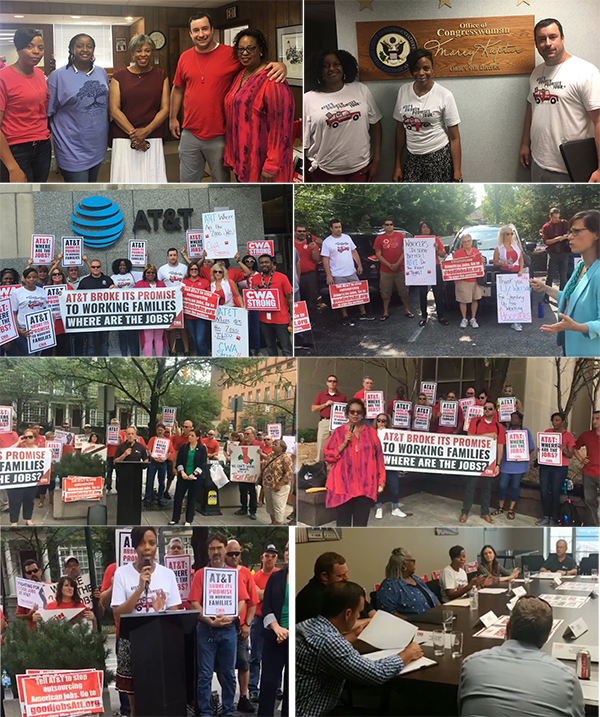 As AT&T continues to stonewall CWA members at AT&T Midwest and AT&T Legacy T at the bargaining table, AT&T workers kicked off a multi-state "Broken Promises Tour" this week calling attention to the effects of ongoing job losses and offshoring in communities across the Midwest. The tour began with a press event in Detroit where AT&T workers were joined by local labor leaders to call out AT&T for continuing to cut U.S. jobs in the wake of the GOP tax bill, then made its way through an itinerary including Toledo, Columbus, Indianapolis, Bloomington, and Kansas City. The workers will wrap up their trip on Saturday in Dallas, home to AT&T's headquarters, where they will deliver thousands of petition signatures demanding that AT&T make good on its promises to American workers. Before the Republican tax plan passed, AT&T CEO Randall Stephenson pledged that if the tax cut passed, the company would spend at least $1 billion to create "7,000 good jobs for the middle class." Instead, despite $20 billion in tax savings, AT&T has eliminated more than 7,000 jobs since January 2018, when the tax cuts took effect. The company has made $10 billion in profits in the first half of this year, and has used that money on stock buybacks to enrich its wealthy stockholders instead of investing in its workers. At each stop, the workers have been joining with former AT&T employees whose jobs were eliminated and elected officials and community leaders who are taking a stand against AT&T's outsourcing and offshoring. They've also visited the district offices of members of Congress, sharing information about AT&T's job cuts and urging them to hold AT&T accountable. Along the way, workers have been gathering signatures on a petition urging the company to invest in jobs here in the U.S.
"I worked at AT&T for 15 years, and I loved my job," said Kelly Clay, who was laid off in 2017, along with many of her coworkers. "It's getting harder and harder to find good jobs. Many of us are struggling to make ends meet. AT&T makes big promises to American workers. But in places like Kansas City, they've broken those promises time and again." "Big corporations like AT&T and those running for office need to know that working people in America won't be forgotten," said Jeremy Bain, who has worked at AT&T's call center in Saginaw, Mich., for 14 years. "Our families and communities have been left behind by companies like AT&T that line their pockets offshoring U.S. jobs and collecting big tax breaks. It's time for AT&T to invest in the workers and communities that have made the company successful." "In 2011, AT&T shuttered the call center I worked at for 11 years, despite our area manager's assurance that there was plenty of work to keep the center open," said Laheelah Hunter, who has worked at AT&T for almost 19 years. "I'm joining the Broken Promises Tour to hold AT&T accountable. I don't want to continue to lose colleagues to layoffs or outsourcing from a multibillion dollar company that owes its success to its workers." CWA has also launched radio ads across the Midwest and in Dallas highlighting how AT&T used its tax break to enrich executives rather than create jobs and raise wages for U.S. workers. Workers have been livestreaming their progress at each stop and have attracted local news attention to AT&T's failure to live up to its promise and support good jobs in communities that it serves. Check out the highlights at ATTBrokenpromises.org. 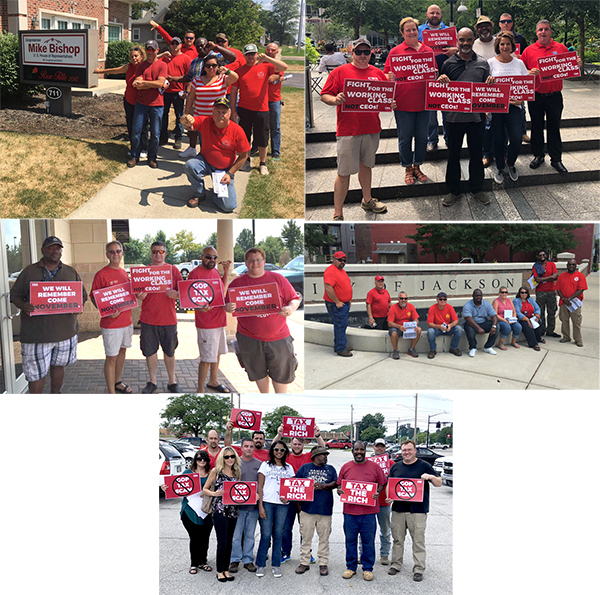 As AT&T continues to stonewall CWA members at AT&T Midwest and AT&T Legacy T at the bargaining table, AT&T workers kicked off a multi-state "Broken Promises Tour" this week calling attention to the effects of ongoing job losses and offshoring in communities across the Midwest. Stops include Detroit, Toledo, Columbus, Indianapolis, Bloomington, Kansas City, and Dallas. Days after authorizing a strike, CWA Local 1400 and IBEW System Council T-9, representing 1,200 Consolidated Communications workers in New England, came to a tentative agreement with the company. After four months of difficult negotiations, the hard-fought agreement was secured within hours of the contract expiration. 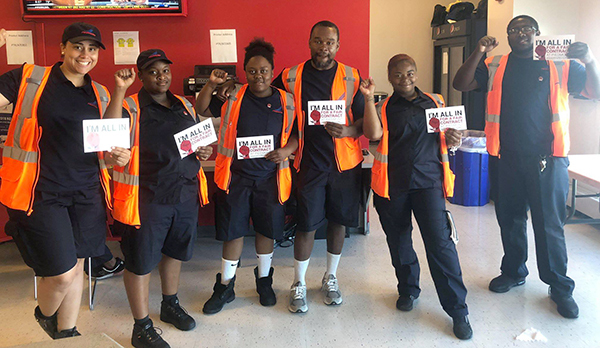 Six months after more than 800 Parking Production Assistants (PPAs) voted unanimously to join CWA Local 1101, they're fighting to win a first contract. PPAs secure parking for film and television productions throughout New York City, usually arriving 12 to 24 hours prior to production and working through the night in their personal vehicles to ensure that parking spaces are secured for production vehicles and equipment. As they headed back to the bargaining table this week, CWA Local 1101 mobilized with an informational picket to get the word out that PPAs demand respect and a fair contract. 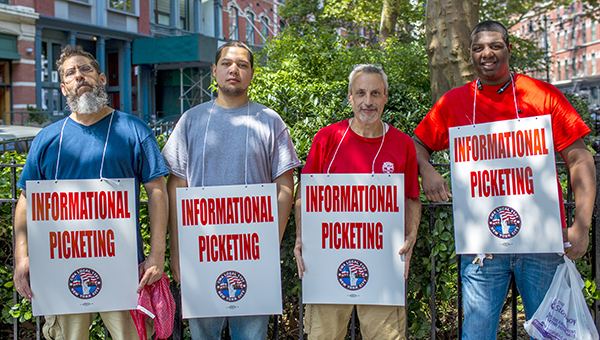 Parking Production Assistants (PPAs), members of CWA Local 1101, are fighting to win a first contract. 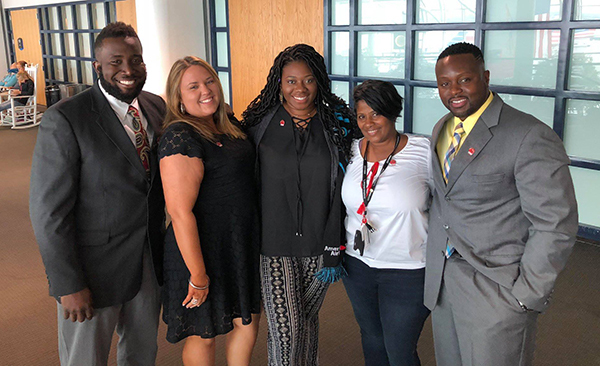 As the CWA Piedmont Airlines bargaining team heads into mediation this week, Piedmont workers are wearing CWA pins to show they are powerful and united! CWA members and retirees in Missouri played a critical role in defeating Missouri's Proposition A, a so-called "Right to Work" ballot initiative. Voters rejected the measure by a huge margin. CWA activists collected thousands of commitment cards against the measure, signed up new contributors to the CWA Political Action Fund, and turned out volunteers. They hand billed, phone banked, and canvassed daily in heat that was more than 95 degrees, completing more than 450 volunteer shifts in a six-week period. In addition, CWA reached out to voters across the state with radio, social media, television advertising, and direct mail. On top of the hard work that went into beating "Right to Work," CWA members also helped elect Karla May to the Missouri State Senate. May, an AT&T Service Representative who is an 18-year member of CWA Local 6300, won an upset victory over incumbent State Senator Jacob Hummel. She has served for more than eight years as a State Representative, and will continue to be a strong voice standing up for working people at the capital. Missouri CWAers are ready to take this momentum into the November elections, including electing more legislators like May to stand up for working families and stop the attacks from corporations and special interests, and passing Clean Missouri, a critical bill to increase government transparency and to make sure neither political party is given an unfair advantage when new legislative maps are drawn up after the next census. This historic victory shows that working people can stand up to big corporations and win! CWA members and retirees in Missouri played a critical role in defeating Missouri's Proposition A, a so-called "Right to Work" ballot initiative. CWA members are putting pressure on elected officials who sold out working families by voting for the Republican corporate tax cut bill that gave huge tax breaks to the super-rich and big corporations like AT&T. This week, CWAers leafleted outside of the offices of Reps. Mike Bishop (R-Mich.), Tim Wahlberg (R-Mich.), Barbara Comstock (R-Va.), Jim Renacci (R-Ohio), and Steve Chabot (R-Ohio) to educate voters on how the corporate tax cut bill is harming working families. The Republican-controlled FCC voted last week to adopt a dangerous anti-worker "One Touch, Make Ready" (OTMR) policy that sends CWA members' work – done by skilled employees who know the equipment and have extensive training – to unskilled, untrained, low-wage contractors. The Commission ignored hundreds of comments submitted by workers urging the the FCC to protect public and worker safety and protect good jobs. The OTMR policy allows companies that want to add equipment to a utility pole to move existing equipment. A local OTMR ordinance in Louisville, Ky., has been disastrous, with dangerous mistakes made by contractors. Pole attachment work is complex, and if done incorrectly, can cause electrocution or poles to fall. In addition to the serious safety risks, the policy also invalidates sections of private contracts negotiated by CWA and its members' employers, affecting thousands of workers. "It's incredibly disappointing that the FCC approved this harmful anti-worker OTMR policy that risks public and worker safety, especially after so many skilled CWA workers warned them about the consequences," said CWA District 3 Vice President Richard Honeycutt. "This policy gives our work – work with good, family-supporting wages and benefits – to unskilled, untrained, low-wage contractors. CWA members will keep fighting to enforce our right to the work guaranteed to us by contract against any attempts to take it away from us." More than 1,300 CWA members submitted comments to the FCC raising concerns about the proposal. Steven in Brandenburg, Ky., revealed a firsthand account from a location where the OTMR policy has already been put into place. "I am a facility technician for AT&T. Our metro council in Louisville has passed an OTMR ordinance locally," he wrote. "I have already seen questionable and unsafe attachments to our poles. I work on these lines every day. Imagine putting a ladder up 20 feet in the air on a wire that has not been secured properly. It can only end badly. Our job is dangerous enough without adding other untrained, unregulated hands to the equation." CWAers are joining activists across the country in a #StopKavanaugh photo campaign to create an easy, highly visible way for people to speak out about the danger they face if Judge Brett Kavanaugh is confirmed to a lifetime appointment on the Supreme Court. Kavanaugh has a long record of routinely ruling against workers and their families and regularly siding with employers against employees seeking justice in the workplace – including CWA members. As we've seen this year with Janus, decisions of the Supreme Court can have a dramatic impact on working people's rights, freedoms, and legal safeguards. Working people must #StopKavanaugh! Get creative with your sign and write why you oppose Kavanaugh, and then snap a pic. Post it on your own social media with #StopKavanaugh and email a copy of your photo to photos@uniteforjustice2018.com so the Coalition to Stop Kavanaugh can make a video with all of the submissions. Carl Kennebrew was sworn in as the 8th IUE-CWA President. At the 2018 IUE-CWA Conference in Orlando, Fla., in early August, Carl Kennebrew was sworn in as the 8th IUE-CWA President. Retiring President James D. Clark's long career and many accomplishments were celebrated at the meeting, and he expressed his strong support for incoming President Kennebrew. Kennebrew, of Dayton, Ohio, has been a proud member of IUE-CWA for nearly 25 years, most recently serving as President of IUE-CWA Local 84755 in Dayton, the founding local of IUE-CWA. 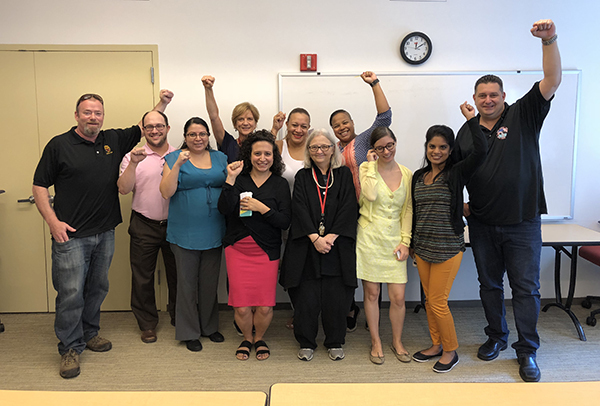 Kennebrew graduated from CWA's Minority Leadership Institute (MLI), an intensive 3-week program dedicated to increasing the involvement of minorities at all levels of our union. Kennebrew also worked as an organizer, served as the local's Legislative Political Action Team Member, and as an Executive Board Member for the Dayton Miami Valley AFL-CIO.